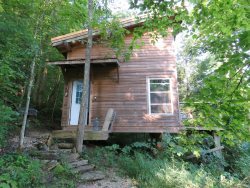 Looking for a cabin where you can use a coffee maker, take a hot shower and turn on overhead lights with a flip of a switch? These cabins come with indoor plumbing and full electric. We even have one (Tradewinds Tree House) with a hot tub!